Apr. 12 (NBD) -- The long-awaited Avengers: Endgame will be released on April 24 in mainland China, two days earlier than its rollout in North America. This was, without doubt, a thrilling news for Marvel fans. However, a recent report has put a damper on their excitement. 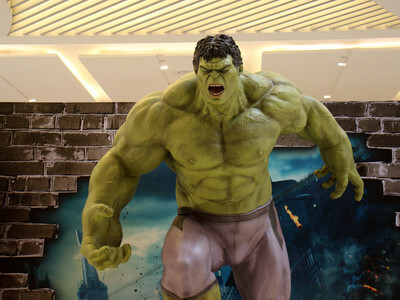 While Marvel guardians of the galaxy have not made big screen comeback, a cinema chain union named Sichuan Film Development Alliance ("the Alliance") cannot hold back their excitement to leverage the upcoming blockbuster to reinvigorate the currently stagnant film market by initiating a price adjustment. A spokesperson for a local cinema in Chengdu, capital of southwest China's Sichuan province, has confirmed to NBD that they have received the proposal by the Alliance, so did cinemas including Wanda Cinemas, UME, Pacific, Stellar and Lumiere. The proposal urges member cinema chains to lift third-party settlement prices to guarantee box office revenue during the May Day holiday. The Alliance's confidence might come from the soaring ticket sales of the film in the U.S. There, Avengers: Endgame, which was made available for advance sales on April 2, sold five times as many tickets on ticketing platform Fandango during its first seven days than Avengers: Infinity War, Fandango announced on April 10. 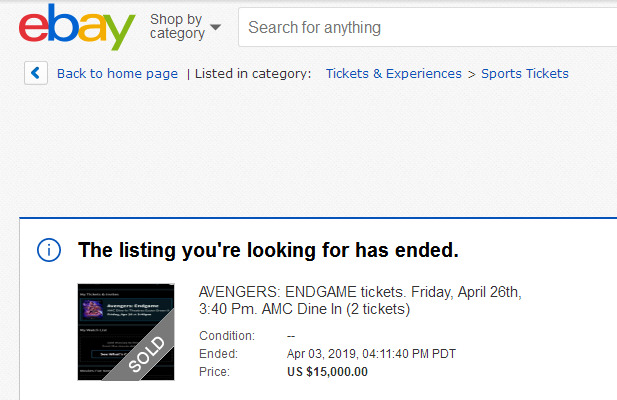 Dramatically, eBay sellers were making as much as 15,000 U.S. dollars auctioning off their tickets in New Jersey for the film. On online ticketing platforms, NBD today found prices of Avengers: Endgame lie between 60-130 yuan (8.9-19.3 U.S. dollars) in Chengdu. However, the average price of other movies on the list is less than 50 yuan (7.4 U.S. dollars). More strikingly, in Shanghai, the superhero film's premiere at 24:00 of April 23 is priced at 286 yuan (42.5 U.S. dollars) on Meituan at SFC Yonghua Cinema City, the only cinema in the city with IMAX 3D, 4K and 4D. Half of the universe's living beings including much loved characters like Doctor Strange, Spider-Man, Star-Lord and etc. were turned into dust in Avengers: Infinity War a year ago after Thanos snapped his fingers. This left Marvel fans heartbroken. The proposed price markup exacerbated the sorrow before Avengers' new story begins. A user named "Marvel-boy" furiously commented, "I'd rather starve to death or jump from here than buy a 120-yuan-ticket". Another user felt so disappointed as his 40-yuan money-off coupon couldn't be used to watch the movie at Wanda Cinemas. The Alliance's suggestion will somewhat kill their zeal further. High ticket prices, coupled with insufficient numbers of cinemas, have fundamentally constrained the increase in the number of viewers. Well-known director Zhang Yimou and Feng Xiaogang proposed during NPC & CPPCC sessions in 2012 that the authority can adopt "pricing guidance" and introduce "maximum price" to boost the movie market. 2019 May Day is around the corner. Avengers: Endgame has attracted much attention from fans and the movie market is expected to recover when it is released. Considering that the film locks in at 182 minutes and in order to ensure the box office during the May Day holiday, the Alliance proposes all member cinemas to adjust ticket prices of Avengers: Endgame during the holiday across the board. In the first 7 days, we recommend that the third-party settlement price is: no less than 45 yuan (excluding service fee) for regular theaters, no less than 70 yuan for Imax at off-peak times and 100 yuan at peak times. For the premiere on April 23, the price is advised to be set at: no less than 60 yuan for regular theaters, no less than 120 yuan for IMAX. All union members please make adjustment referring to the above proposal. At the same time, we hope that every cinema will continue to improve the quality of film screening and take effective measures to prevent illegal recording and pirated copies, to improve the service and to create a comfortable viewing experience for audiences. Wish a huge box-office success!